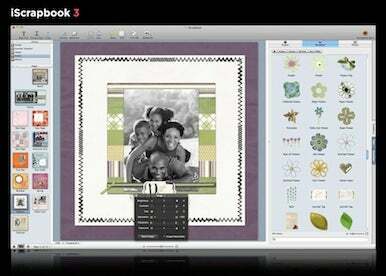 Chronos has released iScrapbook 3, a major upgrade to its digital scrapbooking software. The new version includes twenty new templates, font and cover flow previews, and faster page loading. Like the previous, well-received edition, the latest offers an easy and good-looking way to create scrapbook layouts chock full of photos, artwork, captions, and other graphical elements. The templates are customizable, and provide a quick way to get started on a project. iScrapbook plays nice with iPhoto, streamlining the process of actually getting images into your scrapbooks. iScrapbook 3 comes with 25 “basic” iScrapKits and 16 bonus kits. This upgrade introduces Smart Templates, which allow users to customize placeholder elements, such as text boxes or ribbons, much more quickly. These searchable packages of artwork images include creative shapes, word art, embellishments, and other designer graphics. The new cover flow window (which looks a lot like the one in iTunes) lets you browse for artwork or themes to insert into your project. The new font preview feature shows how your caption or text will look in a variety of fonts and styles. If you’re in need of further visual stimulation, there’s even an animated mode that makes the text fly by in the preview window. As it always has, iScrapbook offers the ability to export or print pages; you can order a professionally printed version, too. iScrapbook 3, available now, requires Mac OS X 10.5.8 or later. You can download a free, fully functional trial version. A single license for the software is $50. A family pack is $90, and allows up to five computers. Owners of previous versions can upgrade the single license for $30, and the family for $50. Impressive offering of templates, graphics, and page designs. Could offer more start-up guidance for users.